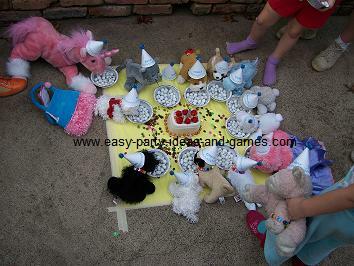 A Webkinz party can adapt some of the fun games from the Webkinz website to play as birthday party games. Lots of kids love the wonderful Webkinz (Amazon link) stuffed animals, so this is not just an animal party! Here are ideas for two different types of Webkinz parties. One is for a party that I planned, and another went to a very creative friend for the party that she planned for older kids. The kids in loved both! Use the ideas and games from one party or the other, or take some from each! On the Webkinz party invitations we told guests to bring their favorite Webkinz or small stuffed animal. We had streamers and balloons in multi-colors everywhere, just like the Webkinz website! FYI - Our party lasted for 1 1/2 hours. First when kids arrived, they could play on the swing set, do a craft (animal coloring pages), or play with their Webkinz or other stuffed animal that they had brought. For the Webkinz and stuffed animals, we had set up a "Webkinz party area" just for the stuffed animals to enjoy their own pretend cake. I had tons of acorns on the ground (it was fall) so I spray painted them white to make "food" for the stuffed animals. The girls loved putting their stuffed animal down on the ground to "play Webkinz party" with the other stuffed animals while they enjoyed the party. Each little girl also received a bracelet for her with matching bracelet, used as a collar, for her Webkinz. These were made by using multiple colors of heart shaped phony beads on stretchy cord. These were a big hit!! Making party hats for each of the stuffed animals out of card stock, stretchy cord and glittery pompoms were also a big hit. These were put on each stuffed animal as they arrived, with the stuffed animal's and the owner's name being written on each side so we could tell each one apart from the other ones. Once everyone arrived, it was time for the games! We started with a Webkinz Says game to try to get the group together, basically Simon Says but saying Webkinz instead. 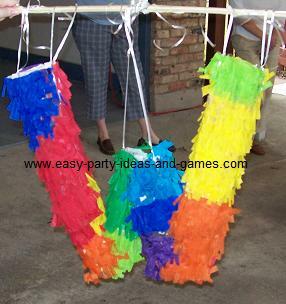 Another game was a Rainbow Race (with bean bags of different colors of the rainbow) – the birthday child holds two bean bags and sends them around the circle at the same time in different directions. The color that makes it back to the birthday child first wins! Next came a Googles and Zingo Pop Game. This was a great way to get everyone’s attention and pull the girls together in the yard to start playing games. I had blown up many balloons of different colors and had them ready in trash sacks. I started emptying in the sacks in the yard and asking the girls to see how long they could keep their balloons afloat. When done we the girls were told to pop them. While this was going one of the grandparents hid “gem bags” around the yard for the Artes Gem Hunt Game. There were enough bags for each girl to have one (plus a couple of extra) and they were filled with the clear colored marbles that are used in floral arrangements. For this game I asked each girl to find me one bag and bring it to me. We put all the bags in a pile and stood in a circle around it. Since we were standing in a circle around the gems, I suggested that instead of playing Ring a Round the Rosy, we play Ring Around the Gems which is the same song as Ring a Round the Rosie, but we said “Ring around the Gems, Pretty, Pretty, Gems, Webkinz, Webkinz, we all fall down.” We did it loud, soft, very slow and then very fast. We then divided the girls into two groups (we had 20 girls) for target games. Half of the girls went to do a bean bag toss. We had a picture of Tiger’s head and we threw bean bags into his mouth. No one kept score, we just had fun trying to “feed the tiger”. The other half of the girls went to do a Pin the Tail on the Puppy. This was found at the $1 store. Then the girls switched so everyone got to play both games. We gathered the girls together again in a group and played the Dog and Cat Game. I had already put a strip of tape across the yard. The “dog” would be on one side of the tape, and all the “cats” would be on the other side. The dog would jump over the tape and all the cats would have to run to the other side before he could catch them. So the idea is to always be on the other side of the tape. Of course no cats were ever caught, but after a few minutes some started to tease him by putting a toe over the line, so we moved onto the Puppy Dog, Puppy Dog are you Hungry?. I suggested that we ask the dog if he was hungry, and we said “Puppy Dog, Puppy Dog, are you hungry”? and the dog said “no, come closer”, and kept telling us to come closer each time we asked until eventually he said “yes! !” and would chase the cats trying to catch one. After all these fun game, it was time for our cake. Visit a photo of the Webkinz party cake, which was designed by the birthday girl herself! After cake we had a Webkinz pinata, which we had made ourselves in the shape of rainbow colored a "W". First the shape was made out of boxes taped together. We put a string around it from the bottom up. We then covered the shape with layers of strips of newspaper with a mixture of water and flour as glue. When this dried after a few days, it got covered with fringed crepe streamers in different colors (like on the website). We stuffed it with candy, plastic coins and animal stamps. Afterwards it was time to pass out favors and tell everyone goodbye! For favors, other than the items in the piñata – we gave pencils with animals on them, a wooden tic tac toe game (from the Target dollar spot - love that place! ), bag of gems from our gem hunt game. Now I'll tell you about a fun party for older children, where they old enough to be self-directed during the party. Like the Webkinz party above, the invitation told each girl to bring a Webkinz or favorite stuffed animal. As each girl arrived, they had a decorated sack with handles for the Webkinz to go inside. This way they could carry their Webkinz with them, but there would be no confusion in case two people showed up with the same Webkinz. First, the girls played a great game of Zingos Pop in the front yard. Just like in the party idea listed above, each girl had a balloon tied to their ankle by a string, and they raced around trying to pop each other's balloon without getting their own popped. Next, each girl was told to go around to different "stations" to earn Webkinz party cash. As they earned their "Kinz Cash", they could go to a "W store" (set up on the dining room table) to redeem their cash for items. Some of the items in the "W Store" included candy, pens/pencils, rulers, notepads, Webkinz bookmarks, etc. In other words, fun trinket type stuff. The girls loved getting to pick out their own favors, and loved earning "cash" to go shopping at the Webkinz party. A real spinning "Wheel of Wow" made for the party! Artes Gem HuntA bakery made a cake with an drawing of the birthday girl's favorite Webkinz as the decoration. Another big hit!